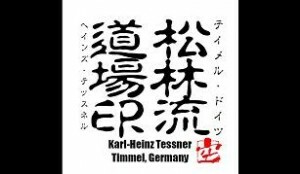 colleague from Germany reminded me about a request he made earlier this year about a custom-made dôjô-seal with his name and style and stuff. And guess what, I am the man to ask! If you choose the regular seal-manufacturing shop here in Japan to get yourself a custom made seal carved in old seal-script – and that’s what you want, you need to have -, say 10 x 10cm, it will cost you something between 500 and 1000 Euro. No joke! Probably this guy studied 20 years to get his license. Well, I studied 20 years too, and got no license. I just do! So here it is. Took me about two hours of work. © 2011 – 2015, Andreas Quast. All rights reserved. This entry was posted in Kanji art. Bookmark the permalink.